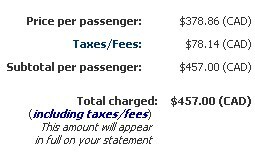 There's some unusually cheap fares from Saskatoon to Alaska occurring on Delta and United at the moment. The typical bottom price to Alaska is around $700 roundtrip after taxes, so this is approximately 33% below the usual lowest price. It looks to have affected fares all the way up to August 2013! 2. Click on the Calendar icon - this is an important step, as it shows you where the cheapest fares are occurring throughout the year. 3. When you see a date range you like, click on it. Then scroll down and choose your outbound flight. And then choose your return flight. And then click on Book with Delta, or Book with United, whatever the case may be. The above search was to Anchorage (ANC) but it looks like flights to Fairbanks (FAI) have dropped as well. I haven't tried any other Alaskan cities yet but they could be worth a try. saskatoon, yxe, flight deals, united states, united, delta, anchorage and alaska.